Discussion in 'xLights (Nutcracker)' started by smeighan, Sep 7, 2012. 3) Start Wamp. Click on the Pink W icon. This zip file also now contains gnuplot so you dont need to install it separately. MaterDaddy wrote this script for me, Thanks!! same login and password as you have always used. For future code releases, you just do step (5) above. Just unzip the file on top of your local nutcracker directory. This step is only a few seconds. Step 6 - Make sure you run as administrator as otherwise you may not be able to save the registry entry. I would be curious of people's experience in timing. Might I suggest removing the entries from the 'members' table and instead resort to people creating their own local account? I randomly picked about a dozen users from the local install 'members' table and easily found a reserve of the MD5 hash for the passwords. Some of the passwords may be likely to be re-used elsewhere for other accounts (like email, banks, forums, etc). Distributing a database containing usernames and passwords is what gets others excited in the news. What i can do is set all of the md5 passwords to "welcome" before i export the members table. and just tell local host users you log in to your account with "welcome"/. If we already have a local install of Nutcracker working and download the latest zip (1.0-124) can we just copy over the new files? Do we have to do anything to update the DB with your new tables? After you have wamp installed, you never need to repeat steps 1-4. For these massive changes please do steps (5) and (7). Unzip this file into c:\wamp\www\nutcracker. 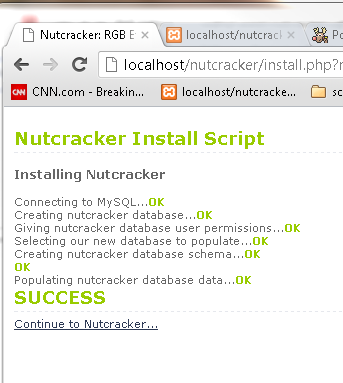 If you already have a nutcracker directory, just overwrite everything there. 7) When you get Localhost working, install the database. Modify nothing and just click submit. Be sure to get a fresh zip file as i just added some more stuff. For these massive changes please dp steps (5) amd ((7). corrected bug that would not export data to the sequencers. download a new zip file and redo step (5). This is what you do anytime i release new code. You DO NOT need to delete your database (Step #7). Unzip this file , open it and copy the contents of the nutcracker directory. Next go to your c:\wamp\www\nutcracker and paste over it with a ctl-v. In other words replace the c existing code tree with what you just downloaded. i think i would uninstall all of wamp, and re-install it. maybe there are links on google about cleaning up a partial wamp installation. i got the same error as you a few months back and that is what i did to clean it. I have windows 8 and am using xampp.